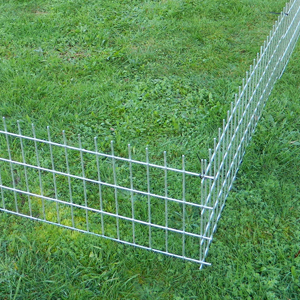 Recently, we have been having inquiries for a fence that would be effective against rabbits. We have been working on this problem for a while! 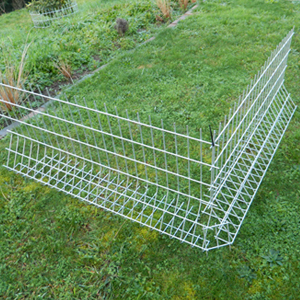 Our two test sites are working well and we can report that our new rabbit fencing also seems to be effective against pukekos! We have reduced the thickness of the wire to 3.15mm in order to produce cost-effective panels. 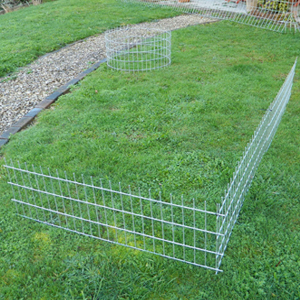 The mesh size is smaller than that used for chickens and is 50 x 100mm. We are offering two styles of panels – a free-standing, easily movable type (similar to our chicken fencing) and a flat push-in panel. And we are now able to transport 2.4m long panels, so we can also offer a DIY round tree guard which offers 700mm diameter and 350mm height. All these products are hot-dip galvanised (just like a farm gate and we can confidently say that they will outlast you, the customer! Panels are 800mm or 1200mm long and stand 450mm high. Panels can be joined using cable ties to make any size or shape of fence. Panels are 1.2 m long and stand 350mm high when pushed into the soil. Panels are easily cut or bent to suit your purpose. Panels can be joined using cable ties to make any size or shape of fence. Panels are 2.4 m long and 350 mm high. The panels can be easily bent by two people into a circular shape 700 mm in diameter which can be joined using cable ties. 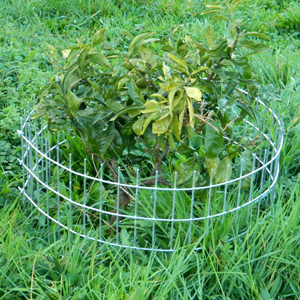 This tree guard will prevent ring-barking and low foliage damage on trees. WARNING Wear denim jeans, robust footwear and gloves when handling this material.